School and education should never become another commodity that people indulge in, if they have the wealth to do it. . . and it shouldn't be available to selection either. 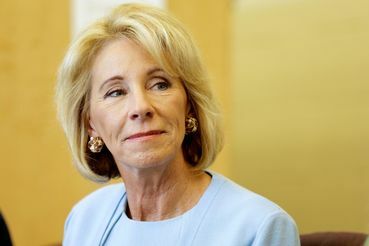 Thanks Judy--school choice should be limited to accountable public schools (the most successful charter schools are not privately administered but are public schools--like all charters in MN). The conception of markets as essential for the survival of personality liberty. In the neoliberal view, if you’re public institution and places don’t look like markets, with a range of customer College Assignment Writing Service option, then you aren’t actually free. The objective of neoliberals is thus to rollback the condition, privatize public services, or (as in the container of voucher) wangle forms of customer choice and marketplace regulation in the community sector. Never, never, NEVER should profit be put ahead of our children's educational needs! We have sold out our future. Thanks Judy for sharing the link to the article by Jason Blakely. Making profit off of education is immoral in my opinion. Thank you everyone. I agree with all of your comments. Betsy DeVos represents a great threat to education in this country. This threat has many facets, including that of blurring the lines between church and state. Its too bad we can't get anyone interested in education and understanding the science of learning and how it applies to human development. Plenty of folks talk all around it, few understand it and even less advocate for it. Despite a privileged life in this country and having opportunities rare in other parts of the world, we rely on immigrants to provide us with innovation, focus and intellectual rigor. Our schools have become surrogate family centers, so parents can work fulltime hours for never enough wages that can't make ends meet and are left without any time to parent. Schools, no matter the resources can not replace parenting. It's an impossible task no wonder they can't teach and children don't learn. No school, public or private can fix that. Betsy DeVos is just another in a long line of pretentious, self centered pirates that cannot think beyond her jewelry box. She wouldn't know education if it bit her and is capable only of promoting her lifestyle ambitions. It's interesting what kind of mindset operates within Donald Duck, as to what led him to appoint the people he has appointed. . . without exception, they're ALL unsuitable candidates for office for serving the welfare and health of U.S. citizens. Interesting question Darren.......is he a "quack" of a president.........? If you are given something to take responsibility for, will you then care for and nurture it or neglect it and allow it to whither and crumble on your watch? What would be then the sum total of your efforts, I killed it? Right out in the open, its an interesting challenge. It's much easier to snipe from the sidelines. It's a huge gamble. So, Trumpetiers are you going to undermine the country which serves as the base and host to your success? Do you know how to steward your resources or will the conflagration of your ego consume America and leave the carcass in the ditch, or merely maim and cripple to prolong the agony of your victims? As the world watches and bears witness, will your epithet read - significantly responsible for downfall of the American experiment - too short sighted to see what was in your own best interest. Hero or villain? The duck has a life time history of narcissistic abuse. I have my opinion. Given the beauty and prevalence of social media, an observation or faux pas committed has a far wider reach than it used to have. . . . we have to use this medium to get the message across that our "power-possessors" are quite irresponsible and incompetent. Darren and Marco, I completely agree with the points you make. Part of my background education is in Developmental Psychology, and I think that the critical importance of education in the health and survival of society, even of civilization, depends on a vitally functioning education system. The corporate fools running this country treat our children and their future as an afterthought in the budget, a target to drain more value away from, so they can buy more weapons. Parasites are lining up to extract profit from our children, and would gladly make them into compliant automatons, devoid of any real desire to learn or to analyze. The social media can be used to wake some people up, but there is a hell of a lot of idiocy out there, too. Some people use it to reinforce their stupidity and narcissism -- come to think of it, like Trump's Tweets. I think Trump is like an embodiment of all the ills of this country. I can't help but think he wants to destroy it. I totally agree it shouldn’t be done because I am currently working as a Senior Academic Writer at Best Academic Writing Service and I know how expensive education is, especially when it is a private school. So by privatizing it will make it difficult for average earning families to afford their children education.